No matter the reason for snowshoeing, whether it be for transportation, sport or simply enjoying the great outdoors and experiencing the beauty of hiking through freshly fallen snow, you need the best snowshoes you can get to fit your specific requirements, or you might find yourself struggling through or sinking into the snow-covered landscapes you are exploring. The right pair of snowshoes will offer the most traction you can get, which is an essential part of a snowshoe, the floatation and stability are as important as the other attributes in this type of footwear. We look at the different snowshoes on the market covering the three major styles which are the flat surface, rolling and mountain snowshoes. View the Best Snowshoes for the money, Below. What to look for when Buying Snow Shoes? 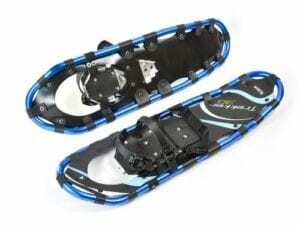 What Size Snowshoes Should I Get? What are the Top Snowshoes for Beginners? What are the Top Snowshoes for Mountaineering? What are the Top Snowshoes for Backcountry? What are the Top Snowshoes for Snowboarding? What are the Best Budget Snowshoes? Your weight, type of snow you are traversing, whether wet or dry and depth of the snow will all make a difference when deciding which one to purchase. What you are going to use them for, such as hiking, climbing (click here for the top climbing shoes), or running and cross-training will all influence which snowshoe will be the most appropriate for you to use. We review the best on the market for 2019 to make your choice a lot easier. When looking at snowshoes traction and flotation and stability are some of the most important aspects and the MSR Lightning Ascent provides all three to ensure that your experience walking in the snow is a great one. The 360-degree frames of these snowshoes and the split teeth Torsion2 crampons distribute the weight evenly and allow the snowshoer to have constant and continuous contact with the snow ensuring ultimate stability. The PosiLock AT bindings are freeze resistant and come in a two-piece attachment that is independently conforming. The modular flotation tails offer the ability to maneuver through the snow easily and the Ergo Televators prevent fatigue when asking and also add to the traction to allow you to take on the challenge of steep terrains. The ergonomic design lets you engage the televator with just a flick of a pole grip. The decking on these great snowshoes are strong and durable as well as being ultra-light and perfect for traversing. If you are looking for a snowshoe that will offer you security and stability with a 360-degree frame, PosiLock AT bindings and Ergo Televators along with split teeth Torsion2 campons and Modular Floatation tails you can be sure these ultra-light snowshoes will enable you to traverse any snowy terrain you are faced with. Traversing through the snow is a lot easier if you have the right snowshoes on that offer all the features you will need to rise to the challenge, offering great traction, fit and comfort you need to rise to the occasion. Hyper flex technology in the TSL Snowshoes allow the frame of the snowshoe to conform to any terrain so this is a very versatile shoe. The length of the shoe can be customized and the memory toe adjustment binding system and ratcheted instep strap secures your foot in the snowshoe offering superb stability and comfort. The carbon fiber inserts of these snowshoes allow the shoe to flex and in flexing it stores the energy and return it at the end of your stride, this feature helps to reduce muscle fatigue when walking through the snow. The composite material the shoe is made from makes it extremely durable and lightweight and this adds to its versatility. The four-point binding adjustment system with a ratcheting telescopic length adjustment and buckle ankle strap allows you to get a very good fit, this ensures that you are comfortable and stable in the shoe for you to be able to tackle any type of terrain. The TSL is designed to accommodate those weighing between 110 - 260 LBS. Superb features that include hyper flex technology to reduce muscle fatigue, memory toe adjustment binding system, ratcheting instep and carbon fiber inserts, offers you the most comfort and superior fit. It is versatile and can be customized for comfort and offers great stability to tackle any terrain and let you enjoy your adventures in the snow with ease and confidence. Looking for a great lightweight versatile and durable snowshoe that offers you the most value for money you can get when considering a snowshoe then the Chinook Trekker snowshoes are definitely ones you need to consider. They are easy to walk snowshoes and are perfect for those people who weigh between 59 and 90 pounds. The heavy-duty aluminum frame offers you the durability you need in a snowshoe along with ultimate comfort. UV resistant decking that is constructed from polyethylene and features a dual ratchet binding and heel straps with quick release buckles, these features will all benefit any snowshoers. The Chinook is ultra-durable and easy to use, it offers you the ability to traverse any terrain in comfort and with confidence. The aluminum crampons are able to rotate freely with a tail that will drop to allow the shoe to shed any snow that might gather on the shoe as you walk. The shoe bites into the snow giving you the grip you need to be able to take on mild downhill slopes. The Chinook comes with accessories which include a carry bag that has an adjustable back pack strap, side handle and mesh ventilation window. The Velcro pole carriers are included and offer a limited lifetime warranty. Snowshoes that come with features that ensure you get the most traction, stability, and comfort as well as some superb accessories. The Chinook Trekker snowshoes are lightweight and durable, they feature a heavy-duty aluminum frame, UV resistant, polyethylene decking, dual ratchet binding with heel straps and quick release buckles. With the MSR Revo Ascent, you get the best of both worlds, the durability of the steel teeth and the flexibility of the torsional flex plastic you will not find a better, more versatile and stable option on the market. The external traction is provided by the perimeter teeth of the ExoTract deck with split teeth of Torsion2 crampons which enables the shoe to distribute your weight evenly and allow you to maintain contact with the surface even in the harshest conditions. The injection-molded plastic deck is ultra-durable and also allows the shoe to flex with the torsional flex for a deep purchase in heavy snow. The modular floatation tail, which is available to purchase separately, will give you great maneuverability. Fatigue-reducing Ergo Televators heel lifts ensure you get the best traction even on the steep hills and the ergonomic design engages with only a flick of the pole grip. The reinforced nose allows you to kick step while climbing in any conditions. The MSR is jam-packed with features for you to enjoy your snowshoes to the max and have fantastic adventures in the great outdoors. ExoTract deck with split steel teeth, injection-molded plastic deck, and Ergo Televators heel lifts give you everything you need this type of footwear. The reinforced nose allows you to kick step in any snow conditions. A comfortable, durable and very versatile option that can be used in almost any snow conditions even ice and hard snow. The 180 Pro binding allows for great stability and a secure stride as it holds your foot snugly in the shoe. The heel cramptons are there to aid you as you traverse or descend on sloped terrain. It is lightweight, with an aluminum frame. The frame will swing separately from the binding, this enables the shoe to minimize snow build up as you walk. The Fit-Step frame technology also reduces fatigue as it lessens the impact as you walk. Durability is provided by the carbon steel teeth, these are found on the ball of your feet and allow you to grip not only hard snow but also ice. The SoftTec decking is durable and lightweight with a floatation that offers a smooth soft texture. A great option that fits snugly, offers the traction, stability, and floatation you need to tackle even hard snow and ice. Looking for a snowshoe that is capable of getting you over not only hard snow but also ice, then look no further. The SoftTec decking makes it comfortable and durable with the carbon steel teeth on the ball ensuring great traction. The fit-step frame technology and a frame that will swing separately minimizes snow buildup. This great pair of snowshoes is suitable for people weighing up to 225 pounds. The large SPL binding will fit sizes 10 – 15 and are designed to be one of the best snowshoes for backcountry snowshoeing. The single pull loop binding keeps your entire foot snugly settled into the shoe for great stability. It also offers quick entry and exit from the shoe and, unlike the webbing straps that require readjustment, the Crescent Moon does not. Maneuverability is provided by the tear drop shaped frame without any loss of floatation. The deck is both lightweight and durable. The stainless steel crampons are located under the foot and provide you with an aggressive grip. The toe claw gives you the power to push when climbing and offers you great traction. These snowshoes are 95% recyclable so you explore the beauty of snow and be environmentally responsible at the same time. The deck is lightweight and durable. For snowshoeing in the backcountry, you could not ask for a better pair of snowshoes. The single pull loop binding enables you to enter or exit the shoe easily. The toe claw and stainless steel crampons provide you with the traction you need and on top of all that it is 95% recyclable. Love snowshoeing and exploring the backcountry then you need a shoe that offers dynamic binding and great stability. The Boa Closure System allows you to distribute the tension around your foot and the flex tail minimizes the stress on your joints. It offers a torsion deck design, flex tail, and carbon steel traction rails. The Viper 2.0 carbon steel traction rails allow you to traverse steep and uneven terrain with ease. The rotating toe cord, with rotation limiting design and the heel riser to reduce fatigue and lessen the strain on your calves and offer you a shoe that can cope with even the harshest conditions in the backcountry when snowshoeing.The binding is easy to take on and put on, the traction on the snowshoes are superb allowing you to traverse any kind of terrain with ease. The Tubbs will be suitable for traversing even thick snow when blazing your own trails when backcountry snowshoeing. One of the best snowshoes for backcountry hiking, they offer a Boa closure system to keep your foot securely in the shoe, the flex tail minimizes stress on your joints and the heel risers take the strain off of your calves. Blaze your own trail in the backcountry with ease with these great snowshoes. The Tubbs Xplore has an ergonomic design with a streamlined shape and very lightweight, this makes the Tubbs a very easy to use option that is easy to walk in. The polyester decking provides lightweight flotation and offers a texture that is both smooth and soft. The webbing straps and heel adjustment are easy to use quick fit bindings and are compatible with a large number of winter boots. The carbon steel instep crampons are free to rotate and will bite into the snow giving you the traction you need, and the tail drops to minimize snow build-up. The heel crampons also help to aid in traction and help you when tackling mild slopes. 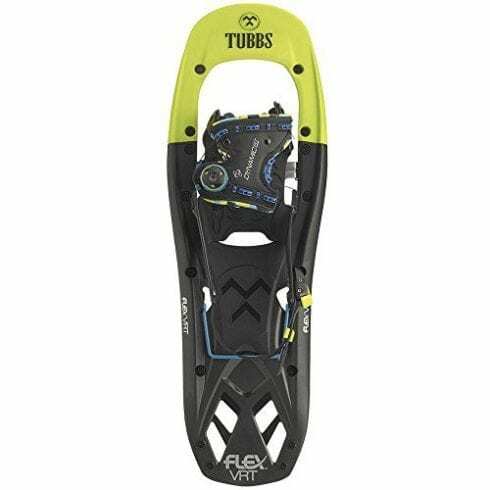 The Tubbs is one of the best hiking snowshoes on the market and you will be able to blaze your own trails in the backcountry with ease and confidence. Comfortable, easy to use, offering great traction and the ability to tackle mild slopes and uneven terrain, the Tubbs Xplore is a great option. The lightweight polyester decking on these snowshoes are designed to be easy to wear and easy to walk in. The tail-drop minimizes snow build-up and the heel crampons and carbon steel instep crampons offer you some of the best traction. It offers webbing straps and heel adjustment for the perfect fit and great comfort. A snowshoe that is designed to traverse even harsh terrain, the surface of the deck is optimized and protected from abrasion as it is integrated into the deck below the deck and inside of the frame itself. The ReactiV-Trac construction of the shoe combines the traction offered by the serrated t-frame and the flex of the shoe is provided by the elliptically formed nose. The Sping-Loaded Suspension or SLS patented design will suspend the shoe underfoot, this allows the shoe to move freely. Although it packs flat, it is designed to cater for the bigger boots and the flat binding features a single urethane z-strap which is quick-lashing. The durability of the shoe is provided by the V-frames that are made from sturdy aluminum, they track straight even in deep snow and the tail pulls that are tapered allow less snow to gather on the shoe as you walk. The perfect snowshoe for when traversing rolling terrain, and is not only durable, but also stable and provides some of the best traction available. This snowshoe offers a host of features that will allow you to tackle even deep snow. It tracks straight, has an optimized deck that is integrated into the frame for protection from abrasion and the patented SLS system with a V-frame made from aluminum making it very lightweight and durable. One of the best mountaineer snowshoes on the market the Tubbs snowshoe is a durable, lightweight and perfect for use on all terrain. The Tubbs Mountaineer has three sizes, 25 inches for people weighing between 120 to 200 pounds, a 30" for 170 to 250-pound snowshoers and 36” with a weight range of 220 to 300 pounds. The SoftTec decking offers lightweight flotation and durability. The ultra-precise ActiveFit binding offers you the exceptional comfort and will keep your foot secure in the shoe no matter what adventurous excursion you may embark on. The Anaconda crampon makes the board exceptionally versatile and able to go everywhere and do anything in the shoe. The bindings are designed to be able to fit any size of boot and are not gender specific. Explore any terrain in the backcountry or go mountaineering in these great snowshoes that offer the best traction, stability, and comfort you can get in these types of footwear. This snowshoe is for serious adventurers who enjoy a challenge. They offer three sizes for different weight categories this is a non-gender specific and are great snowshoes for both men and women. They offer a number of features including Anaconda crampon and lightweight flotation and SoftTec decking. The ActiveFit binding keeps your feet secure in the shoe. These snow boots have been designed for cold and wet outdoor conditions as they are waterproof and comfortable. These boots deliver waterproof protection and have microfiber lining that is heat reflective and actively works to keep you warm. The durable rubber outsole has multi-directional lugs that deliver great traction and keeps you stable on icy conditions. These snow boots are incredibly comfortable as they have an EVA footbed for support. They are made for all-weather protection and offer a comfortable level of insulation during the coldest winter months. There are a variety of different colors and styles available in these snow boots. These snow boots are versatile and durable as they offer all-weather protection and warmth in all seasons. If you are somebody who likes adventure and loves to hike, you will know how difficult it is to do when walking through snow. Snowshoes have been designed to make that task a little easier and have been around for hundreds of years. When you are looking for snowshoes you must always consider what type of terrain you will be tackling. Snowshoes fit into three categories, these are flat terrain, rolling terrain and perfect for mountain terrain. There are also a few of these types of footwear that are designed for mountain biking, trail-running, fitness and even climbing. When you are deciding what type of shoe to choose you will also consider the deck size and binding type and traction and material of the shoe you choose. We take a look at the different key specifications to make your search for the best ones on the market in 2019. These styles are best for beginners to use. They are best for walking on flat terrains that are not too challenging. They are great for families and feature bindings that are easy to adjust. They have a more modest traction system and include entry-level options that are very well priced and offer great value. These types of snowshoes are designed for hikers and backpackers. They can cope with both rolling terrain and steep terrain and are best for backcountry snowshoeing. They have crampons that are aggressive and very secure bindings. They are suitable for entry level up. These snowshoes are for serious hikers, mountaineers and backcountry snowshoers. They are designed to be able to cope which challenging terrain up to and including steep and icy terrain. The crampons on these snowshoes are made in a climbing-style and the bindings can withstand very harsh and difficult conditions, being rugged and durable. Decking on a snowshoe is the material that will fill out the frame. The material used on the deck is usually synthetic or composite in nature. The deck on the best snowshoe will provide you with good puncture and impact resistance. The deck size is determined by the frame of the shoe. Some snowshoes have oval and others tapered frames with different sizes. When selecting the right size for the deck and frame, you do not consider your boot size, you will consider your weight. The heavier the person wearing the snowshoe the larger the frame and deck size. Another aspect that will determine the size of the frame and deck, is the type of snow cover you are going to be traversing, the softer the snow you will be walking through, the larger the frame and deck size you need. Then you need to consider the maneuverability, a larger frame and deck will impede your ability to maneuver over the terrain, it is always best to go with the smallest frame and deck you can get for your needs. When considering the size of the shoe you also need to take into consideration the accessories that you can add to the shoe such as the modular tails. These tails at the back of the shoe and are essential for flotation. You can remove the tails when you need more maneuverability and reattached when you need to increase your flotation. The binding of the shoe is very important as this is what keeps your foot securely on the snowshoe and keeps you stable when traversing areas that are covered with snowfall. There are two different types of binding, the rotating bindings, and the fixed bindings. These types of bindings will pivot and rotate at the attachment point of the snowshoe which is best for snowshoeing in the backcountry. This enables the shoe to drop down. This allows the enables to shed any excess snow it might have collected and allowed you to walk through the snowy landscape easily. Rotating binding enables you to move naturally and is great for talking uphill walks. They are very efficient and comfortable and are recommended for any type of terrain you might like to take on. The only negative of rotating bindings is that they are not easy to use when faced with obstacles that you need to get across such as fallen trees and the like. This is because the tail of the shoe drops down when you lift your foot and will hook on these obstacles. You can overcome these issues if you remove the tail when tackling this type of terrain. There are a few styles that allow the tail to remove and reattach in these circumstances. This is the best type of binding to use if you are going to be traversing areas that are heavily wooded and allow you to tackle any obstacles that you might find in your path. However, in order to allow for this, they do not pivot. This means that the snowshoe is always aligned to the foot. Having the ability to cross these types of obstacles is great. However, because the binding does not pivot, it makes walking and climbing hills rather difficult as you have to move in a manner that is not natural, in fact, it is very much like trying to walk with short skis on. Along with this, the snowshoe does not shed the snow as you walk. The snow gathers on the tail and makes the shoe very heavy and difficult to walk in. The traction of the shoe is provided by the crampons and the heel lifts that are featured. Crampons are usually found just under the bindings of the shoe, this is in the area of the heel and on the sides of the shoe to provide you with the grip you need to be able to traverse through the snowy landscape. These crampons bit into the snow as you lift your heel and will pivot with the natural movement of your foot. This allows you to get the traction you need without slipping, especially when you are tacking up or downhills. The crampons that are found in the heel area of the shoe will slow you down as you move down slopes and the ones on the sides of the shoe provide the traction you need when you are traversing. Heel lifts are the metal bars that you will find under the heel. These can be lifted and are necessary when you are climbing or trying to ascend. They are essential to reduce the advent of calf strain when you are climbing steep slopes as they lift your heel higher to give you the grip you need to move forward. The different parts of the snowshoe are made from different materials that are suited to their specific requirements. The frame of the shoe is usually made from aluminum or some form of composite material such as plastic or carbon fiber. Those that are made from the composite materials usually form a single component with the deck of the shoe that is also made from the same composite material. Snowshoes with a metal frame, however, usually have decks that are made from synthetic material. This material is usually a very durable material such as impregnated nylon, or some form of synthetic leather or rubber. The bindings on these styles of footwear are usually made from a durable nylon material that will not snap or break when you are traversing through even the heaviest of snowfall or ice. While the crampons of the products are made of stainless steel or the more lightweight options are made from aluminum. Snowshoes are ones that are specifically designed for snowshoeing and to be able to traverse snowy landscapes and ice without you sinking into the snow. When you walk you put a lot of pressure your foot and your footprint is a reasonably small area. Snowshoes widen that footprint and spread the weight of your body evenly over a much larger area. This is what prevents you from sinking into the snow as you walk and allows you to “glide” over the snow, this is called traversing. This quality of the snowshoe is called flotation and many of the snowshoes on the market offer modular flotation to make it very simple to walk over the snowy landscapes. Snowshoes do not come with their own boots, you will attach the product to your own snow boots using the straps or ratchets provided. Most snowshoes are designed to accommodate any type of winter boot. The size of the snowshoe you choose will depend on the terrain you are going to be traversing and your weight. The heavier you are the wider the footprint of the snowshoe needs to be to prevent you from sinking into the snow. If you are going to be climbing, descending or hiking across rolling terrain you will choose a different type of snowshoe to those who only use it on flat terrains. The crampons on the shoe are what provides you with the grip you need to bite into the surface and allows you to propel yourself forward. These are usually stainless steel teeth that are found on the sides and under the heels of the snowshoe. The size of the snowshoe you will choose does not depend on your shoe size, it depends on your weight. The reason for this is that the snowshoe is designed to be able to let you float or glide across the snow without you sinking into the surface and getting bogged down. This is the reason they are equipped with flotation. This flotation will allow you to be able to traverse over snowy landscapes, climb or even run. The heavier the person the wider the snowshoe needs to be, to be able to distribute the weight evenly and prevent sinking. Another aspect to bear in mind when it comes to sizing your snowshoe is the area you will be traversing. The lighter and the drier the powder the wider the snowshoe needs to be. 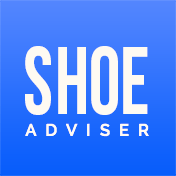 The wider and longer your shoe is the more difficult it will be to walk in, therefore if you are selecting your shoe, be sure to select the smallest one you can get that will meet your needs. The smaller the shoe the more maneuverability you will have. Using snowshoes is actually very simple. You attached the snowshoes to your winter boots, this makes your footprint a lot broader and longer than they would be in normal footwear, and this, in turn, prevents you from sinking into the snow as you walk. You will use the poles that are paired with your footwear to push yourself along as you walk. When using your poles you will need to extend the downhill pole and make the uphill pole a little shorter until they are even in length. The smaller the snowshoe the easier it will be for you to walk in them. Lift your foot off the surface just as you would when walking normally and take your step using the poles to stabilize you as you move. Remember you might need to lift your foot a little higher than normal, this is to minimize the debris you may pick up as you move forward. Ensure that your foot is secure in the snowshoe so that it will not pull off as you step. To do this place the ball of your foot over the top of the hinge of the shoe, then tighten the front strap first. Once this is tight enough for you, you need to tighten the heel strap and finally the instep strap. Make sure the straps are not too tight but just tight enough to keep your foot snugly and firmly secured onto the snowshoe. As for actually using the snowshoe that is very simple. Put them on and walk. It really is that simple. There are a couple of techniques that will enable you to walk better with them on, however, these are also easy to learn and will be dependent on the type of terrain you will be taking on. So going uphill will differ from descending. Walking in deep dry snow will be different to walking on ice and so forth. These are techniques that you will learn as you progress throughout your snowshoe journey. If you are a beginner and are not going to be traversing very difficult areas you need a shoe that gives you the best grip and is easy to put on and take off. The simpler the shoe the better it will be for you to use. 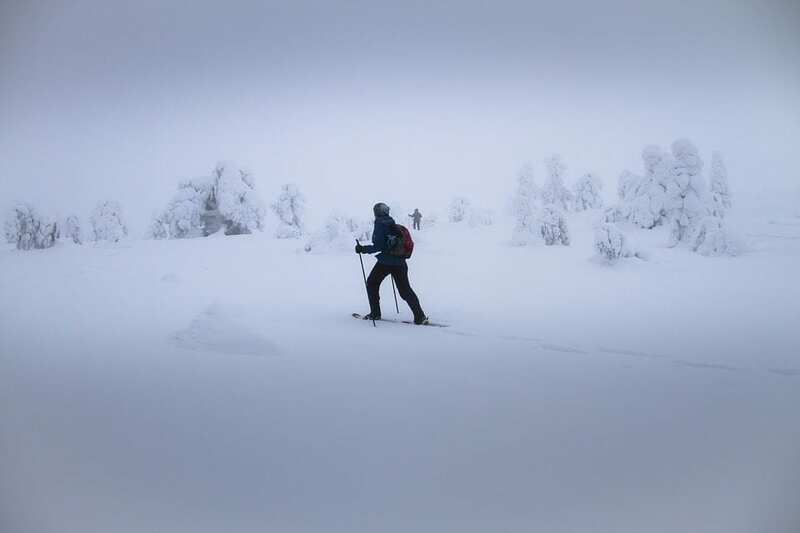 Also when trying out this type of activity, you need a great budget snowshoe to start with. There are a number of men’s snowshoes and women’s snowshoes that are designed to enable you to walk easily through the snow. As a beginner, you would choose a recreational snowshoe that can cope with simple flat terrain and perhaps rolling terrain, but you do not need the heavy backcountry or mountaineering type snowshoes that are a lot more complicated and expensive than your basic ones. The binding on your snowshoes should make it easy for you to put the footwear on and take them off, there are a few makes on the market at offers quick release bindings. Traction and stability are paramount for beginners, so getting a snowshoe that offers built-in crampons (the metal teeth of the shoe that offer you the traction you need by biting into the snow as you walk), and a two-strap binding that will fit on almost any kind of boot and keep your foot securely attached to the snowshoe is best. As snowshoes are not that complicated, you can choose any snowshoe to use as a beginner, however, the easier they are to use the quicker you will become accustomed to using them. The inexpensive snowshoes are great to get the feel of using them before progressing to the more expensive specialized ones for using in the backcountry. 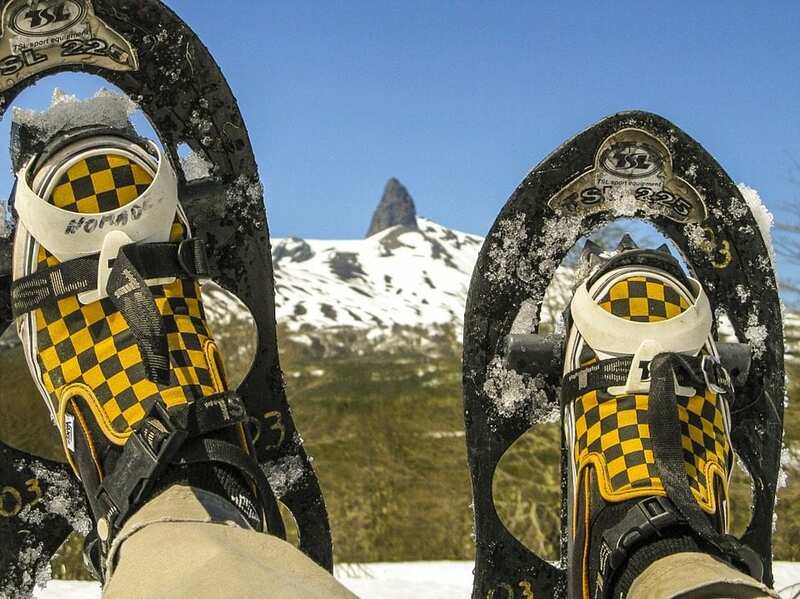 If you are considering going mountaineering or doing other activities that are very rigorous in the snowy landscapes of winter, then you are going to have to get the best quality snowshoes you can to ensure your safety on the slopes. When tackling this type of snowshoeing you need something that is made from the best materials that will not break and leave you stranded. Consider the design and the type of closures that the shoe offers you, the crampons must offer you the kind of traction you will need to be able to climb steep slopes with and of course maneuverability is very important here too. Grip and maneuverability in mountaineering snowshoes are paramount, getting a shoe that will be able to cope with the harsh conditions you find at altitude is very important. There are a lot of less expensive options out there but going for a brand that is well known and well respected when tackling these challenges are best. You do not need to take any risks when you find yourself at elevated altitudes. Consider footwear such as the TSL Snowshoes Symbioz Elite which is designed to take on the more intense challenges. Read our reviews on this great snowshoe to see what they offer you. If you are going to take on the challenge of the backcountry and blaze your own trail, you need a pair of snowshoes that can cope with steeps, downhill and other obstacles you might encounter. Having a pair of snowshoes with the requisite traction and maneuverability is essential here. You need a more rugged pair of these styles of footwear that are sturdy and stable and that will allow you to traverse heavy snow, ice, and uneven terrain. There are a number of great snowshoes on the market that are best for you to take on the challenge of the backcountry. Have a look at the MSR Lightning Ascent which we have reviewed, this is a shoe that offers you the flotation you need along with the grip and stability to get you over almost any terrain with ease. If you are going to be snowboarding you might need some great snowboarding shoes to get you over the flat terrain before you hit the downhill again. This is where a good pair of flat terrain snowshoes comes into play. These are reasonably inexpensive and easy to use. 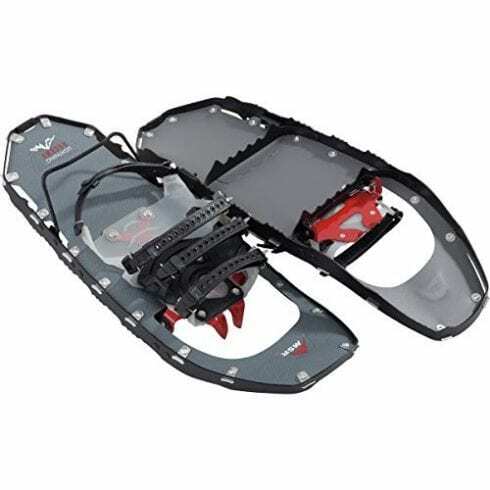 You will need a great pair of lightweight all terrain snowshoes that are easy to carry and easy to use. The ones that are made from molded plastic are a great option such as the MSR’s. Just remember when packing the snowshoes you need consider the spikes on them, you do not want them cutting into you when or if you fall. So you want to try your hand at snowshoeing, but you are not interested in blazing your own trails and exploring the backcountry, you are more likely to want to traverse the trails in and around your resort or national park that has well-defined paths. You do not need something that can cope with steep uphills, loose and soft snow and more. In that case, you can choose a pair of recreational snowshoes that are reasonably inexpensive and can cope with most flat or even rolling terrains. These include offerings such as the Chinook Trekker snowshoes which have all the features and benefits you need in a snowshoe without the expense. When you love to walk, climb or just spend time outdoors in winter you might find yourself faced with a snowy landscape that you need to traverse. When this happens you need the best quality snowshoes you can get to ensure that you can walk as easily as possible with the best traction, stability, and comfort they can offer. Without the right snowshoe, you might find yourself sinking into the snow and struggling to walk. Traction and floatation and superb stability are what you get with the MSR Lightning Ascent snowshoes. The 3600 frames on these great snowshoes, with the split teeth Torsion2 campons will distribute the weight evenly and allow you to have continuous contact with the snow at all times. You get excellent security with the PosiLock AT bindings that are freeze resistant with a two-piece attachment that is independently conforming. The add-on Modular Flotation tails offer you the ability to maneuver easily through the snow. Fatigue is always a problem with snowshoeing, however with the Ergo Televators you can reduce the fatigue and they will also increase the traction on the steep terrain, the ergonomically design allows you to engage with just a flick of a pole grip. The decking of the snowshoes is very tough and the products are ultra-light and are best for traverses. The Modular Flotation tails make these very versatile snowshoes that are suitable for all conditions. The MSR Lightning Ascent is designed for those weighing between 110 – 260 pounds. 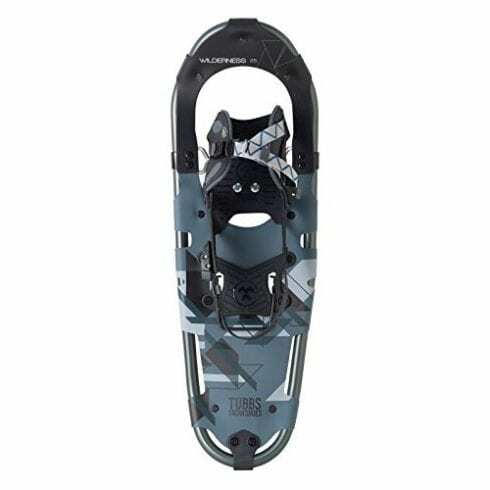 These great features make the MSR Lightning Ascent our top pick for snowshoes on the market in 2019. With its comprehensive features, these great snowshoes will allow you to traverse any and all snowy terrain with ease, offering the best grip, fit and comfort you could ask for in a snowshoe. The Hyper Flex technology in the footwear allows the frame of the shoe to conform to any terrain making this a very versatile snowshoe. The length can be customized easily with the memory toe adjustment binding system and the ratcheting instep strap will secure your foot allowing for the most comfortable fit possible. When it flexes the carbon fiber inserts in the shoe will store the energy (click for study) and then return it at the end of the stride and this helps to reduce the muscle fatigue associated with snowshoeing. An extremely durable shoe made from composite material, the TSL Symbioz Elite is lightweight and versatile. The design of the snowshoe, with the 4-point binding adjustment system that offers a ratcheting telescopic length adjustment and buckle ankle strap, ensures the best comfort, fit and stability to give you the best snowy adventure on any type of terrain. The TSL is designed for those weighing between 110 – 260 LBS. Comprehensive features and superb stability, traction, comfort, and versatility make the TSL Symbioz Elite our premium choice. One of the best rated snowshoes for the money, this lightweight, durable and easy to walk snowshoes are best for people weighing between 59 and 90 pounds. 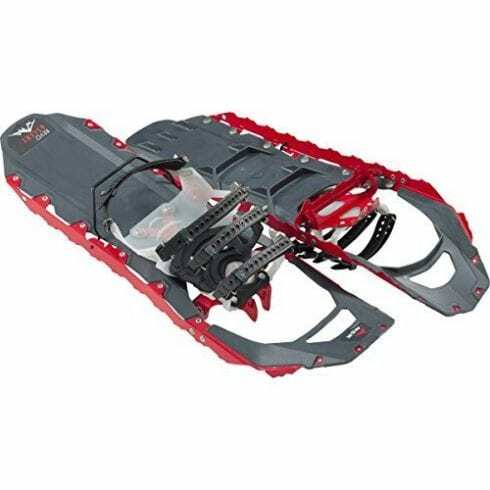 The heavy-duty, lightweight aluminum frame makes this a very durable and comfortable snowshoe. The decking is UV resistant and made from polyethylene with a dual ratchet binding and heel straps featuring quick release buckles. These features make the Chinook very durable and easy to use, it also offers you superb comfort and security when walking in snow (click for biomechanics with snowshoes). The aluminum crampons rotate freely with a tail that drops to enable the shoe to shed snow and allowing them to bite into the snow. The heel crampons provide superb traction for when you are taking on mild downhill slopes. The Trekker includes accessories such as a carry bag with an adjustable backpack strap, side handles with a mesh ventilation window. It also includes Velcro pole carriers and comes with a limited lifetime warranty. We hope you enjoyed our article on "The 10 Best Snowshoes for Backcountry & Mountaineering", if so, please share and rate it. I purchased these Chinook Trekker Snowshoes as they were a great price and being lightweight and having that strong aluminum frame and one feature that I love is having that quick release straps so make it so easy to clip in and out. I recommend these to anyone.